We typically associate fondue with a pot containing melted cheese and dipped bread. However, there are further options for using a fondue pot. You can use one as a vessel for cooking meats for a sociable entrée, for example. Your guests can display their cooking talents by frying their own meats and seafood. You could even add a tempura batter and some dips into the mix to make it more interesting. If meat is not on your menu, this works equally well with vegetables. Alternatively, how about sampling fondue with a tasty broth, or tomato-based sauce for a healthier option. 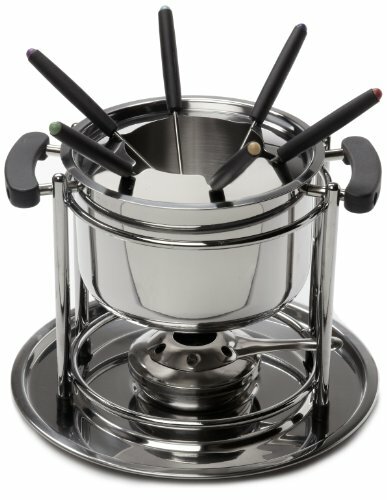 The ExcelSteel fondue set is a perfect option for any type of fondue. Let’s see what it has to offer. Constructed from polished stainless steel, it will grace any table with elegance. It will allow you to explore the many delicacies that fondue has to offer. It is suitable for experienced fondue users or complete novices. The stainless steel makes it durable and easy to clean. You can even prepare your fondue on a conventional stove-top and transfer it to the fondue base to keep warm. A splatter guard is included, to prevent sauces or hot oils from splashing over the side. This guard also has slots cut into it to retain your fondue forks while food is cooking. The base of the fondue sits on a “spill plate,” which is also made from stainless steel. Heat is provided from a gel burner that has an adjustable cover to control the flame. Simply rotate the cover by its handle to provide more or less air to fuel the level of heat. The stand is fitted with rubber feet to give it stability and stop it from moving around. Six color-coded fondue forks are included in the set. These are perfect for dipping and cooking, with each person recognizing his or her own fork easily. The set does not include gel fuel but this can be purchased separately at a reasonable cost. Should You Buy the ExcelSteel Fondue Set? This is a cheap and cheerful option that won’t break the bank. Setup is quick and easy. Food can be prepared on the stove in the fondue pot, which can then be placed on the base over the burner to keep hot. There are no cords trailing behind which may trip people up. The polished finish on the fondue pot looks good and cleans with ease. The handles on the pot make it easy to remove from the stand. The stand itself holds the pot at the top allowing it to sit low over the burner for perfect heating from the flame. It is quick and easy to prepare which leaves you free to entertain your guests. Open a nice bottle of wine, enjoy the company, and the good food. If cheese is not your thing, this set will let you prepare a broth, or use oil, to cook meats. You could use it as a warmer for dipping sauces to accompany other foods. Desserts using a fondue are also a fun way to finish a meal. You could even pretend you are being healthy by using fresh fruit—and then lightly coating it in melted chocolate. Some find the spill plate an excellent addition to this set. It keeps any spillage from going onto your table or countertop, and is ideal for setting the base of the fondue set on. There are a few negatives in respect to this product. The cover on the burner fits quite tightly and can be difficult to adjust using one hand. Additionally, the burner is only designed for use with gel fuel, which can be a little more expensive than alcohol fuel. If you’re having a gathering and serving a traditional fondue, this set from may be a good choice. It is attractive and durable, suitable for novices or experienced cooks alike. The ExcelSteel Fondue Set is very versatile. You can use it for entertaining or just for serving quick and easy snacks. It could even be a dessert option for your next BBQ. Whatever the choice, it is sure to be a crowd pleaser. Newer PostWhat Are the Best Meats for Fondue?